Flat product feeder – with high resolution ink jet printer printing on flat products like pouches, lids, cards without the need of a label. This off-line feeder/printer system will print either a single color; or print 4 colors with CMYK ink printer. The feed system is a pusher lug, with a vacuum bed for better handling of flat products like pouches, lid stock and cards. The DOTMARK High Resolution Ink Jet Coder ink jet printer requires no system cleaning, ink mixing, purging or flushing. Optional OCR/Vision System, bar code verification, can be added to the system. The DOTMARK High Resolution Ink Jet Coder prints high quality single color copy from 100 to 600 DPI. The DOTMARK prints; text, graphics, bar codes. 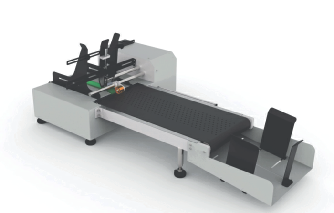 Besides the DOTMARK High Resolution Ink Jet Coder, the flat product feeder can be integrated with: a 4 color ink jet printer, laser coder, P/S label applicator or thermal transfer printer. Flat product feeder can be integrated with: a 4 color ink jet printer, laser coder, P/S label applicator or thermal transfer printer. It can feed flat products up to 12” wide x 14” long; and up to 3/8” thick. Vacuum bed improves handling of flat products to the printer.